I recently watched the very epic ending of the Shrek 2, and when the cat draws his rapier, he shouts "On guard!" to the castle guardians. I perfectly understand the meaning from the context, but was unable to find the exact usage situtaion in any of the dictionaries. Is it the similar to "Defend yourself! ", when a person wants an attack not to be by surprise, but a fair battle and gives their opponent a chance to ackwnowledge the attack? en garde (interj.) Used to warn a fencer to assume the position preparatory to a match. Interestingly enough, on guard can also be found in dictionaries, but it means something a little different. The very useful OneLook page also lists entries for en garde. 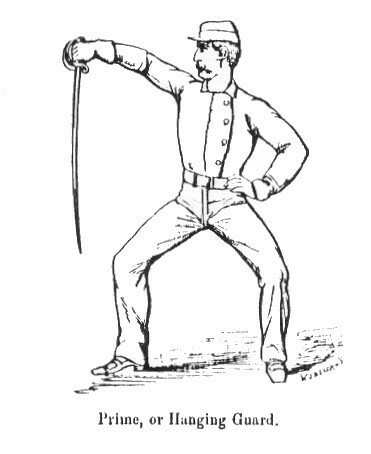 For instance, this gentleman from "A New System of Sword Exercise for Infantry" is in the "prime guard". As J. R. mentions, the phrase is borrowed from French, and is occasionally said by fencers before they practice against each other. It means "get in position", with an implied "I'm about to hit you". What's the meaning of “due cause”? What's the meaning of “in the spirit of”? What is the meaning of “spring reloaded”? What's the meaning of “no maypole”?